For five hundred years the term ‘cordon bleu’ has been associated with superior cooking and culinary techniques. The name ‘Cordon Bleu’ (meaning blue ribbon) originated with a 16th century French order of knights, L’Ordre du Saint Esprit. The members of the order were dubbed Cordon-Bleus because of the broad blue ribbons on which they wore the cross of the Holy Spirit. They held legendary sumptuous banquets and as a result the term cordon bleu became synonymous with culinary excellence. In 1895 Marthe Distel, the author of ‘La Cuisinière Cordon Bleu’ a weekly journal devoted to the culinary arts, founded the first Le Cordon Bleu school in Paris, France. Since that time, the school has flourished around the world with programs ranging from Le Cordon Bleu Le Cordon Bleu Culinary Arts Patisserie and Baking Diploma programs to Baking and Pastry Certificates, Le Cordon Bleu Associate degrees in Specialized Business; and Le Cordon Bleu Hospitality and Restaurant Management Diploma Programs. If you would like a taste of some of the mouth-watering recipes originating from Le Cordon Bleu you can start here! Each month we will publish a tried and tested recipe from one of the great Le Cordon Bleu publications. You can amaze your family, impress your friends and maybe even inspire yourself to go on and qualify at a Le Cordon Bleu school. Accredited to Austrian bakers, but with origins in Italy, Florentines are cookies made from a wonderful mixture of sugar, butter, cream, nuts and fruit. Crisp to eat, they have the added allure of the optional, though traditional, chocolate base. 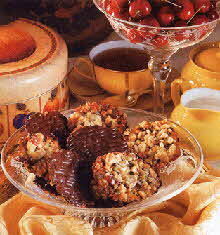 Florentines make excellent petits fours if made with ½ teaspoon of mixture. They will store in an airtight container for up to one week. Any extra uncooked mixture can be stored in the refrigerator for one week. 1. Melt the butter in a small saucepan, stir in the sugar, slowly bring to a boil and remove from the heat. Add the candied peel, cherries, and the sliced and chopped almonds and mix well. Whisk in the cream until it is thick and gently stir into the warm mixture. Set aside for 10 minutes, or until cool and thick. 2. Using a heaped teaspoon of mixture for each Florentine, spoon on enough mounds of the mixture to fill both prepared baking sheets. Space well apart as the cookies will spread. Bake for 5 minutes, or until lightly set. Using a large cookie cutter or a cup, shape the spread mixture into net rounds by pulling in the edges. Return to the oven for 4 minutes. Reshape with the cutter and allow to cool for 3 minutes, or until firm enough to remove from the tray. Carefully lift them with a flexible bladed knife and cool on a wire rack. Repeat with the remaining mixture on another prepared baking sheet. 3. Bring a saucepan half full of water to the boil, and then remove from the heat. Put the chocolate in a heatproof bowl and place over the pan of steaming water, without touching the water. Stir occasionally until the chocolate has melted and then cool to room temperature. Using a flexible bladed knife, spread on to the smooth underside of the cooked and cooled Florentines. Return to the rack (chocolate side up) until the chocolate is just setting. Run a fork through the chocolate to make wavy lines and allow to set at room temperature. Permission to reproduce photo granted to Le Cordon Bleu by Murdoch Books, a division of Murdoch Magazines, GPO Box 1203, Sydney, NSW 2001, Australia (© Le Cordon Bleu 1996). Katrina Boydon is Editor-in-Chief of HQ Publications. Previously, she has worked as a research virologist at the Royal London Hospital Medical College, as assistant editor-in-chief for a journal published by Blackwell Scientific Publications, served as managing director of a postal and courier company, and set up her own business distributing newspapers and magazines in Moscow, Russia. Katrina has a degree in microbiology and studied part-time at the London Business School. Copyright © 2004 HQ Publications. All rights reserved.